I am so happy to be teaming up with the girls from No Place Like Home for a decluttering challenge, and I am going to show you my kitchen organization tips that work. This week we are decluttering and organizing our kitchen space. I cook almost every dinner that we eat. We usually eat out one night on the weekend, but I would much rather cook. I made specialty cakes for several years, and I did the food ministry at my church for 5 years so I am working in my kitchen all the time. 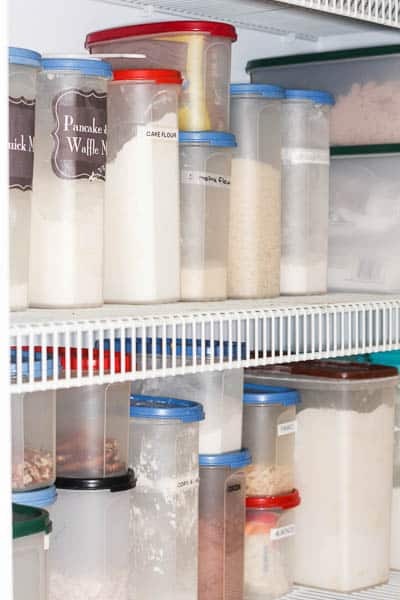 When I was in Culinary School, I learned that you have to be organized in your kitchen to know where your ingredients and kitchen tools are so that you can easily locate them. I have moved things around and purchased many things to get my kitchen organized, and now I have now an organized kitchen that works for me. One of the best things about your kitchen being organized is that you know what ingredients you have on hand when searching recipes for dinner. I would love to have a kitchen organization area that looks like it came from a magazine or Pinterest with all matching jars and matching baskets but if you look closely at some of the pictures, you can tell that the photos are staged. If I used the large glass jars for all my baking goods, I wouldn’t have room for anything else. Also, the boxes of food in the pictures match. You mean to tell me that this woman only uses food that comes in bright blue boxes. Nope, It’s staged. I will show you my real life organization that has worked in my home for years. The other thing to remove from the kitchen is items that you have too many of. Just keep the amount that you will use. I do not need 15 coffee mugs even though I like them. I only need 6 so I pick out my 6 favorites. I do not need so many slotted spoons so I keep 2 and donate the rest, I do not need so many kitchen towels that I can’t shut the drawer so I remove all but the amount that fits in that drawer. You know what I discovered? I do not have wash dishes as often. This really works!! I can’t show before pictures because I have been using these techniques for several years, and my kitchen stays organized. Even when I have a sink full of dishes and grease splattered on the countertop, it feels cleaner knowing my cabinets are organized. I like everything to be easy to access. I can’t stand to have to remove my bowls to get to my plates. 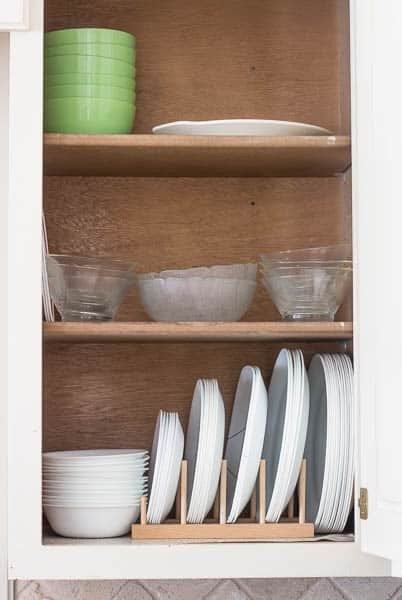 This wooden plate rack is amazing. It cost around $5 and will change your life. I did replace all my dishes with everyday Corelle plates. 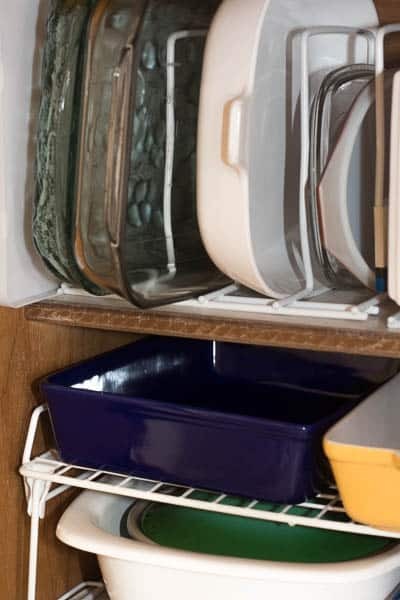 The reason I LOVE these plates and bowls is because they are so lightweight even smaller kids can easily handle them and also place them in the dishwasher. They do not take up much room in the cabinet, dishwasher, or sink (where they sometimes stay for a few days). They also do not break when dropped. I ordered the 18 piece set for $33 (6 place servings)and this set does not come with mugs. I have also purchased extra plates. I still have a nice heavy set of dishes that I use for company. Another area that use to drive me crazy was my cooking dishes. I did not like picking up and pulling out all my pans to get to the one I want to use. This is golden! I saw this slotted kitchen rack on Kevin and Amanda’s blog 5 years ago, and it has cured my problem. The only place that I could find one was Walmart online. I did not mount the rack to the cabinet. You can also turn it vertical for stacking pans, but I like to place it on the side so I can slide my pans in and out easily. I do place my hand on the rack when pulling a pan out so that the rack stays secure. I found that there were items that I do not use daily in my kitchen that was taking up a lot of space. 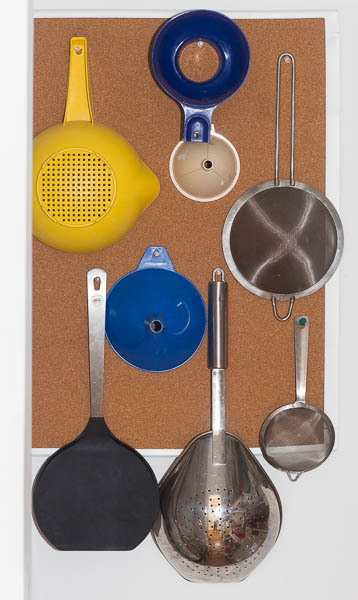 I hung a cork board on my pantry wall and used pin tacks to hang my strainers, funnels, and small appliances. You could do this in a closet or laundry room or anywhere you have the wall space. I scored this beautiful cabinet at the thrift store for $40, and it looks and smells new! 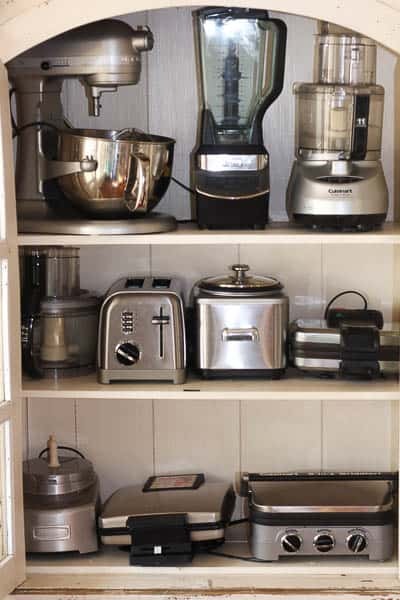 I had no idea where I would use it, but it turns out to be the perfect place for my small appliances. Now for food! 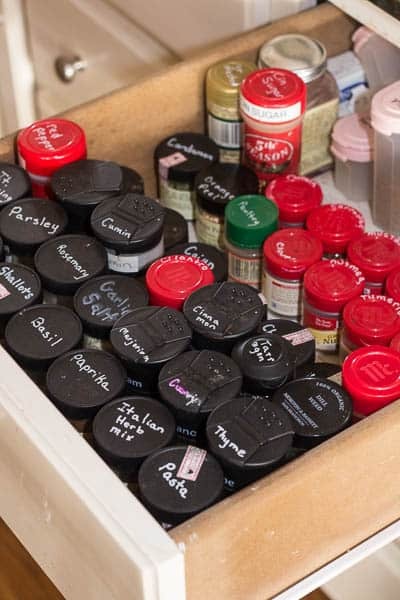 Spices stored in a drawer works so much better for me. I buy my spice jars from Amazon, and I write the name of the spice with a white paint pen on the top of the jar. I need to buy more so that all my spice jars match, but I will do that later. I have tried so many different storage containers for my baking items. I love the giant glass jars with the chalkboard labels but that is not practical for me. I can’t lift that jar several times a day. I love the modular mates from Tupperware. My best friend of 38 years has been a Tupperware dealer for 38 years so I have purchased a few sets at a time when they are on sale. The containers are tall, slim, and lightweight. They are easy to remove off my shelf and place back on. I try to keep a scoop or measuring cup in the container to make it even easier to use. I try so hard to find things that help me and my family live a less stressful life. There is so much stress from school, finances, health, and everyday stuff that comes up. If my kitchen is organized and I can get a good home cooked supper on the table without stressing, I’m happier. 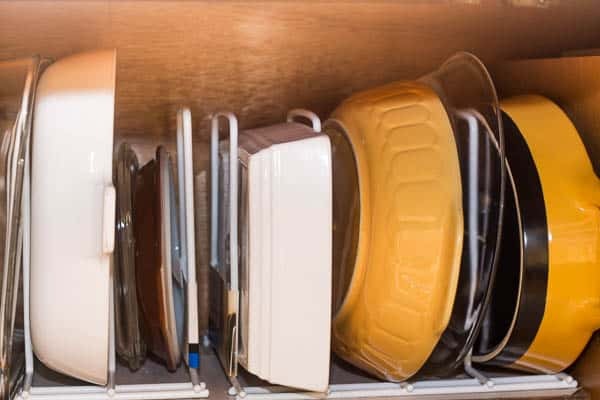 I hope that you can find some kitchen organization tips that work for you. You and your thrift store finds!!!! You are killing me! I love that cabinet and all your organizing ideas. Thanks for inspiring. I love seeing what works for you Sherry, and I’m so glad to see that I’m not the only person who doesn’t have a perfectly matching space. Sounds like we think alike! As long as it works, then its a good thing I believe! 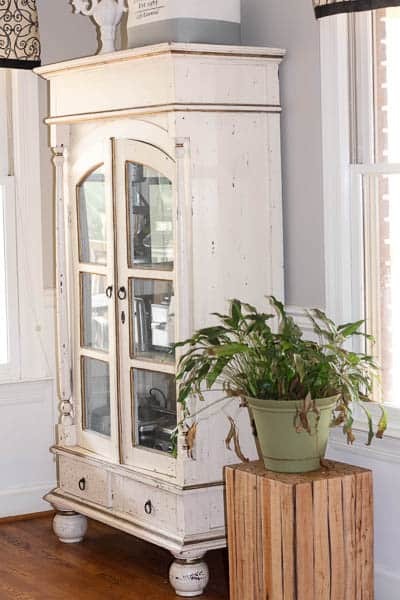 Love the cabinet with all of the small appliances in it, I think I have a space in my kitchen where I am going to start searching for a tall skinny cabinet to add a bit more storage. Sherry, I love how organized your kitchen is! You’ve got so many great organizational ideas! It’s amazing how much stuff we can accumulate in a kitchen if we don’t stay on top of it. Oh, I really need to go thrifting with you! You find the most amazing stuff! 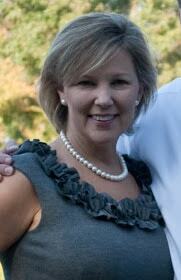 Sherry, I have a whole collection of tupperware that I love. That’s where I store our flour, sugar, pastas, etc. I agree about the big round glass jars, unless it’s stored right on a counter and you don’t have to lift it ofter. You have a lot of great information here, and that hutch for $40 is awesome, my friend! I sure could use some cool storage! Lots of great ideas for a small kitchen! I hope your year is off to a beautiful start! Wow ! Now, these are some practical ideas to organize kitchen in an ideal way. Thank you for sharing such great post! Thank you for sharing practical examples. I adore the spice jars you use and may just have to find a set for myself. If would be nice to have all the jars the same.